There are many things to do and see in the Eternal City. We have a listed a series of websites here below that we believe will help you get the most from your trip. 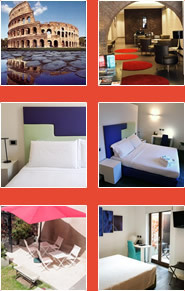 We have also listed a range of our partner hotels in other parts of Italy that come highly recommended. • Easyjet - Cheap Flights to Destinations throughout Europe. • Adr - Rome Airports. • Rome Info - Rome Tourist Board. • Atac Roma - Rome's public transport authority. • Roman Candle Tours - Book a guided tour here. • Hotel Beacci Tornabuoni Florence - A family-run 4 star hotel in the centre of Florence. • Hotel Croce di Malta Florence - Hotel Croce di Malta is located only a few steps from both the Arno River and the Santa Maria Novella railway station. • Hotel Pierre Florence - Luxury 4 star hotel within walking distance of Ponte Vecchio. • Hotel King Milan - The Hotel King Milan is a 4 star hotel located in one of the most prestigious areas of Milan. • Michelangelo Hotel Milan - Ideal for businessmen and tourists alike. • Artemisia Palace Hotel Palermo - An elegant 4 star hotel in the centre of Palermo.